Galaxy S5 Neo: How do I change the LED settings on my Samsung Galaxy S5 Neo? Your mobile device has an LED indicator in the top-left corner on the front of the device. When your device is locked or the screen is turned off, the LED indicator notifies you of events and device needs using different colors. The indicator flashes blue while the device is turning on or off, when the device receives notifications, and when the Voice recorder is active. The indicator flashes red when the battery is low and glows green when the battery is fully charged. 3. 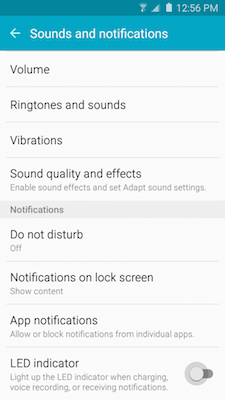 Scroll to and touch Sounds and notifications under the Device tab. 4. Touch the slider to turn the LED indicator off . 4. Touch the slider to turn the LED indicator on . 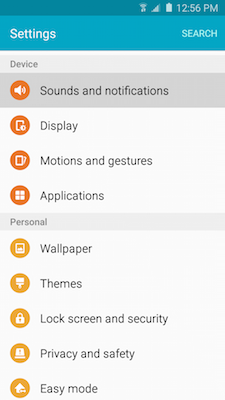 Galaxy S5 Neo: How can I change the font size and style on my Samsung Galaxy S5 Neo?